The Fall 2016 show at the Loveland Museum, “A Collector’s Vision” was brilliant! 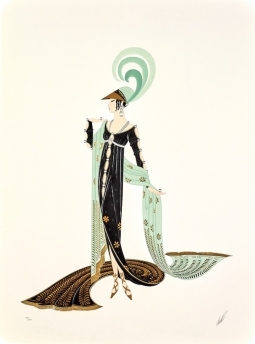 On display were 3 serigraphs by Russian art deco fashion designer and illustrator Erte (accent on the second “e”). 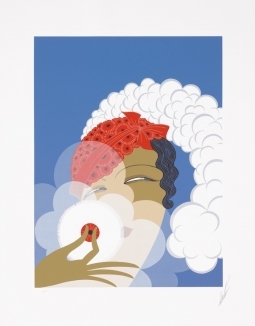 His stylized figures, repetitive surface patterns and designed drapery are wonderful to see in person. The movement in his poses is poetic. I use repetitive patterns frequently in my stone sculpture. “World’s Best Dad”and “Hang On” are two of my favorites for this. I find these patterns mesmerizing and soothing to create. Also, much fun to look at. The entire museum exhibition had over 90 pieces of art by Picasso, Chagall, Matisse, Miro, Dali, Renoir, and Lautrec.